Congratulations to Drs. 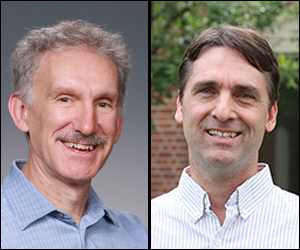 Phil Rasch and Alex Guenther of Pacific Northwest National Laboratory, as they attain the elite rank of scientists elected as Fellows of the American Geophysical Union. The honor is bestowed for "exceptional scientific contributions and attained acknowledged eminence in the fields of earth and space science" and is given to no more than one-tenth of one percent of all members of the organization. AGU is the largest world organization dedicated to advancing earth and space sciences. Rasch and Guenther join two other PNNL researchers, Drs. Ruby Leung and Ghassem Asrar, as fellows, bringing PNNL's total of AGU Fellows to four—the most of any Department of Energy sponsored national laboratories. Guenther is a Laboratory Fellow at PNNL, and world-leading expert on the processes controlling chemical emissions from forests and natural ecosystems, and how they affect air quality and regional and global climate. He has a Ph.D. in civil and environmental engineering from Washington State University in Pullman. Rasch is a Laboratory Fellow and PNNL's chief scientist for climate science. He is an internationally known authority in atmospheric chemistry, climate modeling, and the role of atmospheric particles to influence clouds and climate. His work focuses on computational processes in climate models, describing the components of the atmosphere, and understanding their impact on the climate. He has degrees in atmospheric science and chemistry from the University of Washington in Seattle and a Ph.D. in meteorology from Florida State University. Rasch is also a Fellow in the American Association for the Advancement of Science (AAAS). Rasch and Guenther will be honored with the rest of the 60-scientist class of 2015 Fellows at the AGU Fall Meeting in San Francisco.